Celebrating the life of Robert E Wing, Sr.
Obituary for Robert E Wing, Sr.
Robert E. Wing, Sr., 84, a life-long resident of Morris, passed away unexpectedly in the comfort of his own home on Sunday, November 25, 2018. Robert was born on February 4, 1934 in Oneonta, NY and was a son of the late Fayette and Olga (Johnson) Wing. Robert had a beautiful marriage with Joan Marie Luckhurst until her departure from this earth in 2006. He proudly served in the United States Army during the Korean War from 1951 to 1954 at which time he earned several medals. Robert is remembered for his hard work ethic and dedication which he brought to each job. 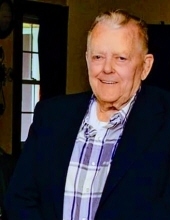 He owned and operated several tractor trailers for over 20 years. Robert chose to come off the road to spend time with his family and worked at Agway for 20 years and then went on to drive truck for 20 more years with Webster Paving. He enjoyed working right up to 80 years old. Robert had a love for speed. He built and raced stock cars for many years. He was inducted into the Central New York Stock Car Hall of Fame on September 22, 2013. Amongst many other hobbies; he enjoyed socializing with his coffee buddies, dancing, and watching sports. Robert is survived by four children from his first marriage Robert Wing, Jr., Christina (Roger) Robinson, Rhonda Wing, Wendy (Jim) McGowan. Later in his life Robert and Joan had one child James (Shelby) Wing. He is also survived by two stepchildren, Cheryl Cotton and Edward Hoag; several grandchildren and great-grandchildren as well as his companion Geraldine Moore. In addition to his wife Joan, he was predeceased by his brothers Fayette and Donald Wing and his sister Iona Mallinson. Family and friends are invited to calling hours at the Johnston Funeral Home, 60 Broad Street, Morris on Thursday, November 29, 2018 from 2-4 PM. A funeral service will begin at the conclusion of the calling hours at the funeral home with Rev. Tim Miller officiating. His burial in Hillington Cemetery with military honors will take place privately and at the convenience of his family. In lieu of flowers, please consider a donation to the VFW in Oneonta or the American Legion in Morris. Donation envelopes will be available at the funeral home. Funeral services have been entrusted to the Johnston Funeral Home in Morris. "Email Address" would like to share the life celebration of Robert E Wing, Sr.. Click on the "link" to go to share a favorite memory or leave a condolence message for the family.